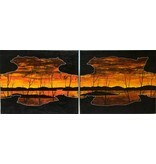 Home / Pair of Sunsets by Kevin Cardinal (Cree). 48" by 24" Acrylic on canvas. Click to read about Kevin Cardinal.